All transactions are safe and secure with a reliable history in online purchasing behind each of our associates. 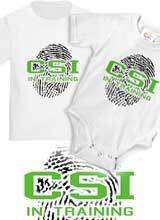 Buy the CSI in Training Adult tees, Onesies, and Kids shirts to own CSI clothing and merchandise. Teach your kids how to conduct a crime scene investigation, and dress them in one of these kids CSI in Training tees while they're learning. Let them each play the role of a CSI character, like Nick Stokes or Sara Sidle, while you pretend that you are supervisor Gil Grissom, Horatio Caine, or Mac Taylor. This design is also available as a CSI onesie, which will look great on your very own baby Grissom. Browse the item to see the adult tee styles, CSI sweatshirts, hats, and boxer shorts. In addition to the CSI in Training Adult tees, Onesies, and Kids tees above, browse the CSI Clothing Gallery for more apparel like men's and women's clothes, kids shirts or hoodies.